Does Ross Gelbspan know this Blog Exists? I believe he does now. Worthwhile question to ask, as was the question about his recent activity, detailed in my November 21, 2015 blog. 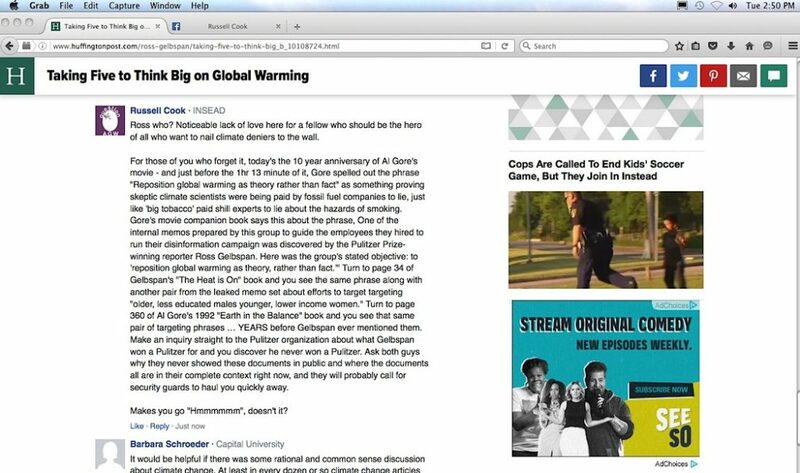 Regarding an update for the latter question, he (or an assistant) still routinely posts article links to his personal Facebook page out of his “Heat is Online” Facebook page … which itself is little more than an aggregator of copied online article links out of his blog site. If he ever directly referenced me or my blog or articles, I haven’t found any indication of that so far. 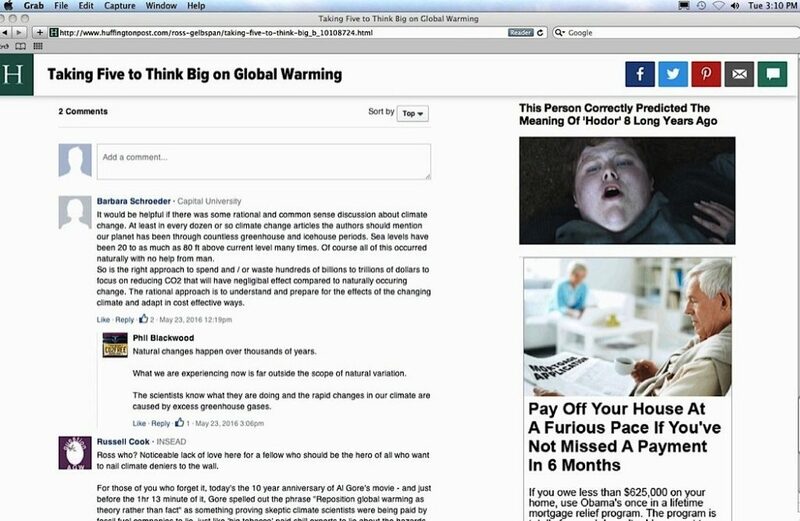 A day earlier, an article of his appeared online at the Huffington Post. Unlike most of his prior material over the last 20+ years, this latest piece was rather dull, devoid of his standard bombast against industry-corrupted skeptic climate scientists. 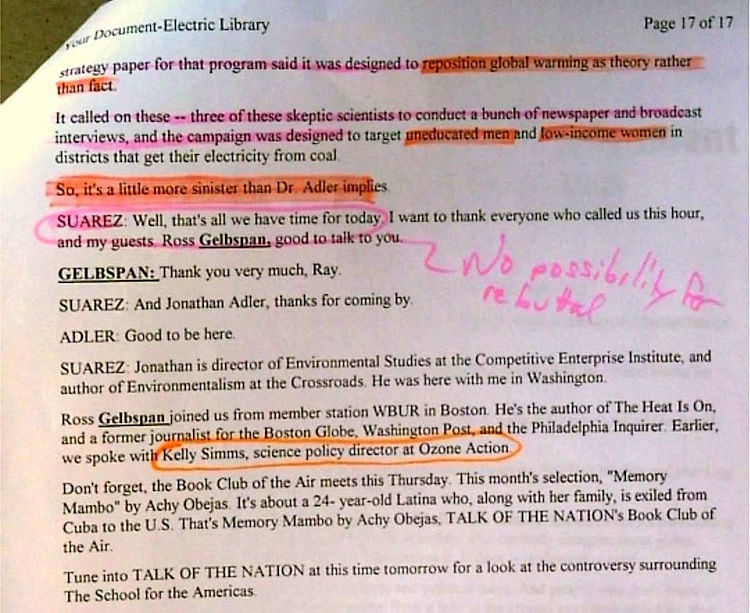 Basically, the piece seemed to be introducing readers to his plan for “Rewiring the World with Clean Energy,” and featured single embedded web link (spelled out here, http://www.heatisonline.org/solutions.cfm ) to his blog’s page about his plan. Hard to miss the conclusion of his piece, subtle as it might be: redistribution of wealth. …Were the industrial countries to help finance a clean energy transition in the developing world, it would create millions of jobs. It would raise living standards abroad without compromising ours…. 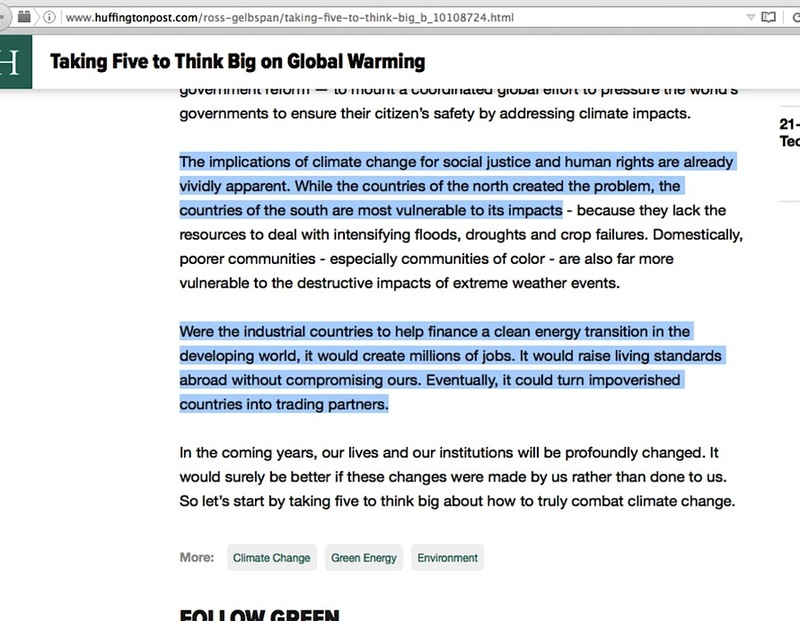 New as Gelbspan’s piece might look at either HuffPo or at his site, all is not what it appears to be. 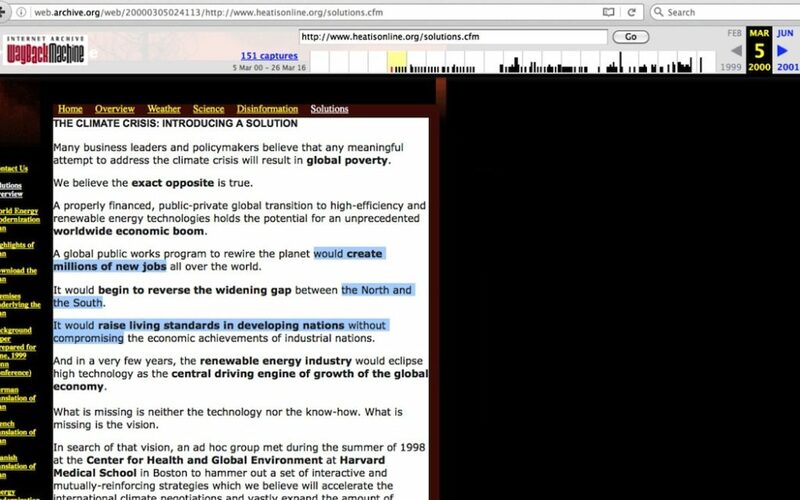 Drop his HeatIsOnline link into the Internet Archive site’s search feature, and that particular page’s history is revealed to be as old as 2000, where the older iterations of the page are considerably longer, on his attempts to spearhead a “World Energy Modernization Plan”. What do we see at the oldest available version of the page? The same basic wording as what’s seen in his HuffPo article. 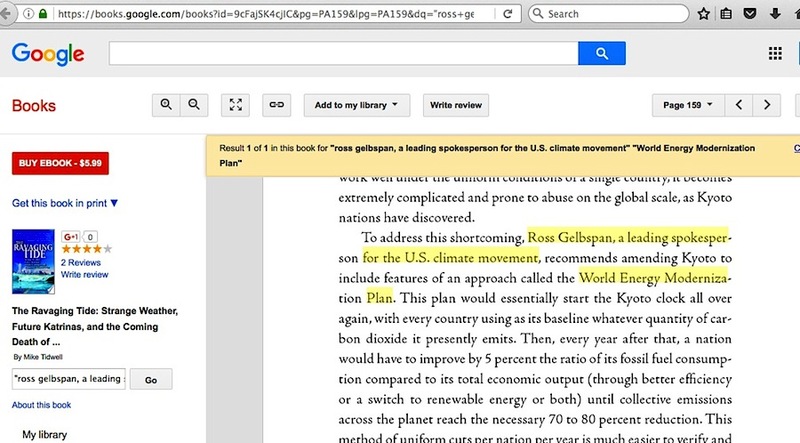 However, Gelbspan’s “raison d’être” is not the vestige of a hidden problem I spotted on May 24th. The “vestige” I encountered was ultimately the result of my placement of a comment at his HuffPo article. Only two other comments where there, when most other HuffPo articles receive many. The area at the bottom of it still says there are only two, despite the obvious appearance of the third one there now, mine (which is seen even when I use another web browser to view the article – for good measure, I got a screencapture of my comment moments after I placed it). At this present time, it appears nobody has replied to my comment. What did Gelbspan’s reply to my comment say? Honest, gospel truth, I have no idea. I couldn’t get a screencapture of whatever was there, and neither Google’s Cache feature nor other web browsers caught the site at the time when his reply was seen. Who knows, he might have initially thought I was speaking positively about his exposé of industry corruption, or he may have bashed out a hostile knee-jerk reaction to the bit about not being a Pulitzer winner. Whatever it was, it was online long enough for me to receive an automatic notification response from Facebook, and there is no way to erase that. My speculation is that he replied to my comment, and then clicked on my “QuestionAGW” avatar (generated by Facebook when I use it to log into such comment sections), which led him to my own Facebook page and its not especially flattering entry about his influence one post down from the top of my timeline at that time. Regarding Gelbspan’s push for clean energy, I’d be fully behind any well-intended effort to create pollution-free power sources which create good jobs around the world enabling all to enjoy prosperity and improved lifestyles. But if such an effort is a make-work situation benefiting One Percenters heading untenable companies, while being sold as a means to solve catastrophic man-caused global warming, in which critics of the so-called problem are marginalized at every opportunity by any means possible ….. then I have a problem with that. 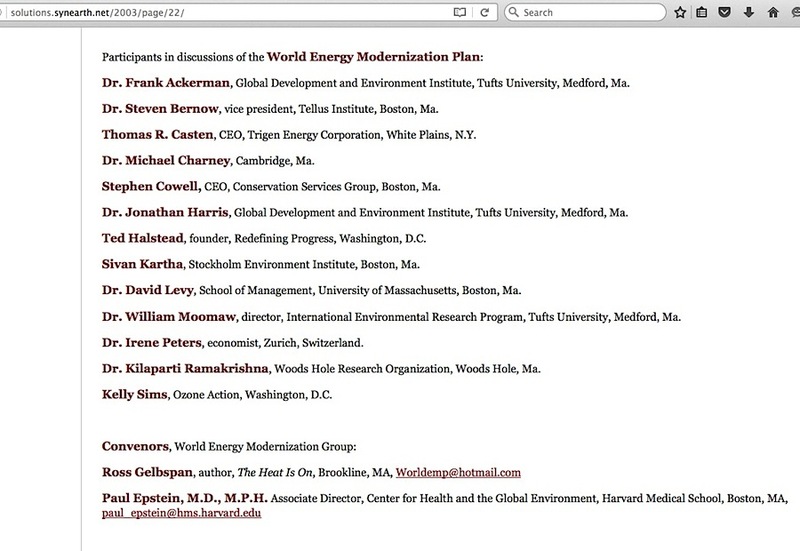 Gelbspan’s 5/23 HuffPo article may have been one last stab at his long-held desire to be a major figure, with various friends and associates, offering a ‘solution to the climate crisis.’ But if he subsequently took time to read my material after replying to my comment at his article, then it’s plausible he’s not only realized that this grandiose dream has evaporated, but also that he’s now facing the far more real and very bleak prospect of trying to guess who might turn state’s evidence against him just to save their own skins in investigations of where the actual ‘racketeering’ in the global warming issue seemingly appears. One last thing here – it would not be logical for Ross Gelbspan to bear a vengeful rage-filled grudge against me. What he should hate is how the manner that the ‘industry-corrupted skeptic climate scientists’ accusation implodes is laying out in the open for anyone – anyone – to see, with the only thing hiding it from view being just a virtual layer of dust called “trust us, don’t question anything about it.” Much like Bernie Madoff’s ponzi scheme, this scheme, with its constant infusions of material that could be libel/slander against skeptic climate scientists, was also doomed to fail from the start, built on a foundation of sand about its core ‘evidence’ that was pushed by a person who never won a Pulitzer, and whose narratives don’t line up right. Rather than bare any hatred toward anyone, Gelbspan, much like Madoff, ought to instead count his lucky stars that this ride has lasted as long as it has. This entry was posted in Information burial by Russell Cook. Bookmark the permalink.